Split Oversized OST File: OST to PST Converter facilitates users to reduce OST file size into smaller parts. It offers to split OST file in different file sizes i.e. 2GB, 5GB, and 10GB without any alteration of data. The tool can easily divide the large sized OST file into multiple smaller size of PST. Merge Multiple OST File: It is the most efficient tool to merge Outlook OST files into one by retaining the originality of the data items. OST Merger enables user to combine or join multiple OST files into One. Users are also able to extract a separate PST for each OST file. Ignore System Folders: The utility allows user to remove the unnecessary folders from the Offline OST files. It easily ignores the unnecessary predefined folders from from the OST file and save it into PST format. To open data from Exchange (.ost file) in Microsoft Outlook, the software comes with advance features and user friendly options. Tool will quickly export OST to Outlook PST file format. 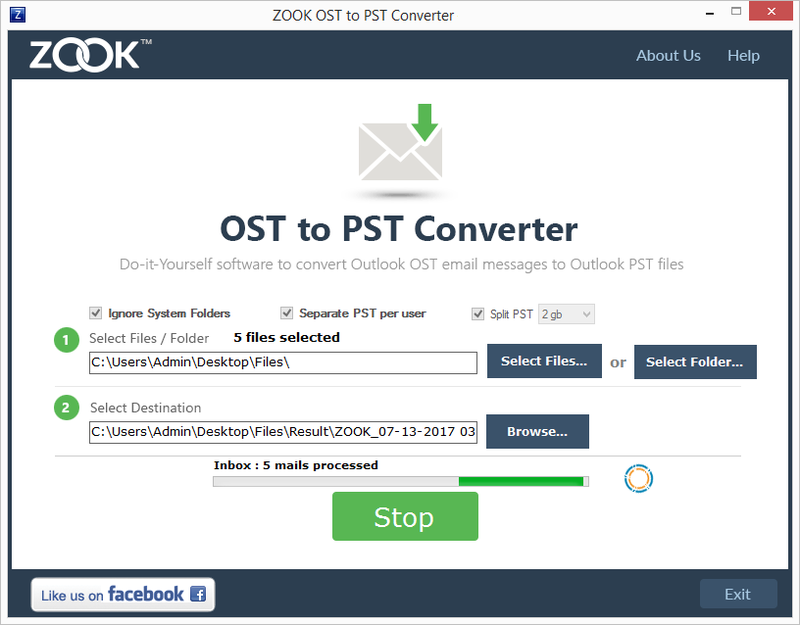 This error free OST2PST converter help to retrieve all those emails, contacts, calendar entries and other updates from OST file in PST format. User can open OST converted PST file in any version of Outlook within few clicks. User will be asked to select OST file from the saved location in Windows OS and then can opt to save OST file into PST format even when OST file is in corrupted form, IMAP OST, orphan OST or is Cached Exchange OST file. Complete solution to convert orphaned OST files to PST format provides advance options like select OST files or folder full of OST file to convert OST2PST. The ability to convert OST file that is not connected to Outlook itself migrate OST to PST the most demanded file migrated by this tool. OST to Outlook PST conversion is the solution for all those issues faced by Exchange users. The OST data corruption, OST synchronization issues, OST email inaccessibility as well as OST orphaned or detached from Exchange environment like situations create lots of troubles for its users. Outlook doesn’t support OST format and there is no direct import options available in Outlook to import OST to Outlook PST. Thus, user look for risk-free software to migrate Microsoft exchange server to outlook. Most of the Exchange – Outlook users prefer to export their OST file format into PST file format because of the troubles that the Exchange server environment awaits them. Regular trouble of Exchange server downtime, server crash leading to data inaccessibility, accidental mailbox user account deletion etc. leads to OST file inaccessibility. This troubles cannot trouble users if they backup data in the Personal Storage File Format. Prevent OST data items data loss by opting to download this utility now. 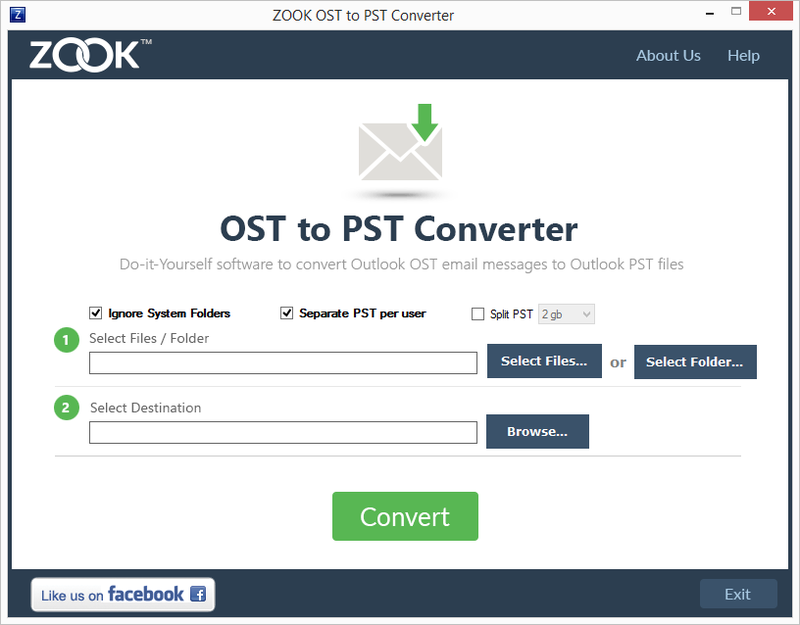 Advance algorithms used in developing the OST2PST converter ensures successful conversion of large size OST file to Outlook importable PST file format. Simple two steps process helps to save OST data items as PST without calling for high end technical expertise or time utilization from user end. Tool to migrate OST format to PST format, keeps OST mailbox items data hierarchy and data integrity intact even after conversion. Uninterrupted OSTto PST file transfer process keeps email properties like from, to, cc, sent and receive date, subject and body line unchanged. Support to convert encrypted, password protected OST file to Outlook PST without any restriction. Works successfully to import OST to PST under any version of Outlook as MS Office 2000, 2002 (XP), 2003, 2007, 2010, 2013 and 2016. (All 32 and 64-bit versions). Facing error messages like: 'The operation failed due to a registry or installation problem. Restart Outlook and try again. If the problem persists, please reinstall.' Or “Cannot open particular Outlook items when offline”. To face and overcome such OST items inaccessibility issues, the primary search from user will be tool to repair OST file. But experts in the industry says that it is better to opt for OST to Outlook PST conversion, rather than going for risky method of OST repair. Migrate OST format to PST will help to export data from a restricted environment to a much wider platform. Tool help to extract PST from OST format and save the OST content safe in Outlook compatible file format that is PST. Tool to convert all Exchange objects to Outlook owned PST format excludes all those risk factors involved in email data management. Newly created PST file from the OST files are easy to be imported to Outlook. Recover Exchange mailbox data with automated OST converter software. This conversion tool is the best of the rest solutions available online with the promise of free OST conversion as well as OST file repair. Download the software to explore its facilities to convert OST to PST format of any Outlook email client editions. When the Exchange server associated with the OST file in unavailable, OST data items will be inaccessible. To avoid this risk of data inaccessibility leading to business downtime, users are advised to download special utility and be secured with OST format accessibility anytime anywhere. Free Converter Supports Outlook 2013 & Other Versions: This application provides free download OST Converter demo version. The demo runs with limitation to export 25 emails from OST format to PST for free. The trial version gives confidence in converting Outlook OST items to PST in bulk with the purchased edition. OST to PST Converter also provides the facility of batch migration by which speed can be boost up for faster conversion from OST to PST format. Data Integrity is also maintained while converting offline Exchange OST file to PST. User has a freedom to select the desired destination file location to save outcome PST file. The tool is so reliable that OST file content can be accessed in PST format, without any manipulation or alteration in data. 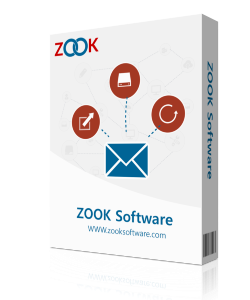 The software is easy and handy to use which does not require any Outlook installation for conversion process. The tool gives the option to create a single PST file per user for single OST file. It is also fully compatible with all the versions of Windows OS for both 32 bit & 64 bit. It can easily support Windows 10, 8.1, 7, Vista, XP and all below editions. It supports all version of Outlook 2016, 2013, 2010, 2007, and all below versions.